How Much Money Can You Make as a Consultant? Is consulting still a lucrative profession? Is the parody of the Aston Martin-driving consultant played by Don Cheadle remotely close to reality? (Cheadle won a Golden Globe for his portrayal of a consultant, which is more than most consultants would get for acting like themselves.) Those questions and more are answered in this post. So, let’s say you’re smart, but not a genius. You have interesting and clever approaches, but you haven’t developed an unprecedented breakthrough in your field. You’re not widely known, but you can build a network. How much should you expect to bring in each year if you do things right? 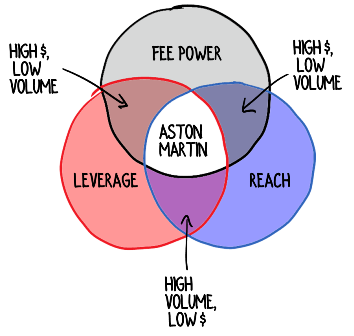 I don’t have enough data to put in good estimates for partners at a large firm, and Don Cheadle’s Aston Martin didn’t seem like a solid indicator. 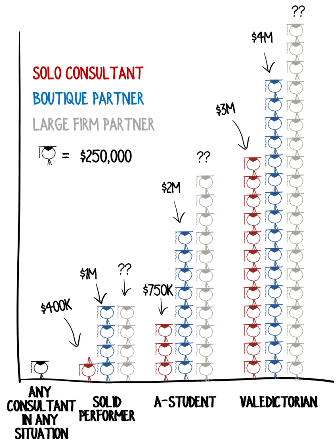 If you have any insight on revenue-per-partner at large consulting firms, please share it in the comments section. Having established the number of kids you should send through Swanky U in one year, the question is: How? How does a consultant move off of academic probation and onto the honor roll? As I mentioned just above, the factors are the same no matter what size firm you’re in. They are: Fee Power, Leverage, and Reach. Leverage is your ability to deliver more value without taking more time. The classic leverage approach employed by large consulting firms is staffing. A single partner who utilizes an army of cheap “utes” to do the actual work can generate gazoodles of revenue. But there are other ways to achieve significant leverage. For instance, off-the-shelf products that require no marginal labor. One famous, solo-consultant sells a couple of million dollars annually in books, DVDs and pre-recorded training courses. Not a bad gig. Low-labor annuities are another great source of revenue that many smart consultancies tap into. Reach is how many potential prospects hear your story. You could be out there knocking on doors like the white-collar version of the Fuller Brush man, or your marketing wizardry could be attracting clients like the Rathskeller attracts Sophomores. (Not that drinking happens on campus anymore. Certainly not.) Either way or both, without more clients, your revenue-generating capacity hits a limit pretty quickly. How much money can you make as a consultant? If you do it right, plenty. You probably won’t be able to reshape the local campus in your image, but putting the kids through school should be a no-brainer. Of course, once they graduate and move back in with you… that’s another story altogether.